Off season produce anyone? Try Aquaponics! Like the rest of the country, Santa Barbara has seen some below freezing temperatures lately. While this freak weather for a place famous for its absolutely stunning weather puts us in a chill while we’re working, our produce just keeps humming along. Air temperature the other morning at 7:30- 35 F, water temperature 60 F. Thank you solar hot water! 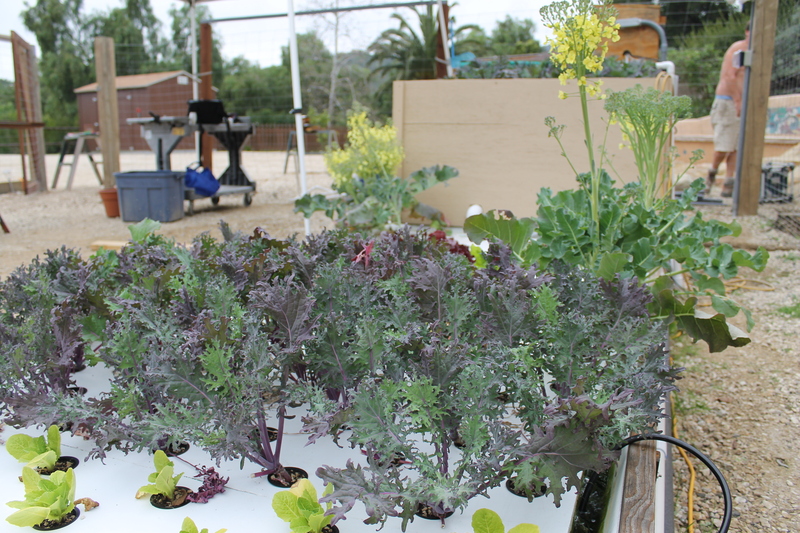 Here at Santa Barbara Aquaponics, we advocate for sustainable solutions to societies problems with food. We will readily admit that we’ve got a long way to go but one of the great parts about what we’re doing is working with solutions that try to reduce our impact on, well, everything. 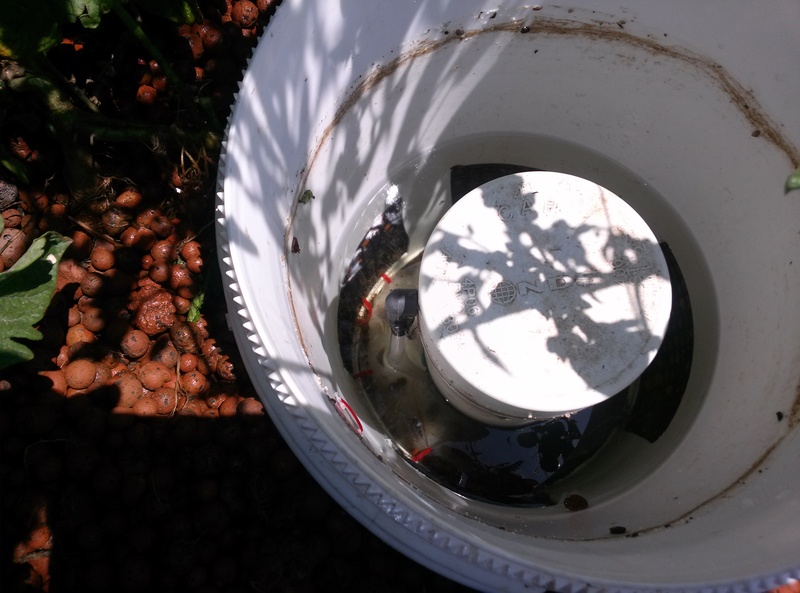 Since early this spring, we’ve had a solar hot water system installed that has done a great job of keeping our water temperature up so the metabolism of our catfish stays high, so they want to eat a lot, so they poop a lot, so a lot of nutrients are generated, so…. you get the picture. We could have installed electric heaters and gotten the temp up higher. Natural gas heaters weren’t really an option with no gas line nearby but we could have also looked into propane but we really don’t need it. The solar does a great job in keeping our water temperatures above ambient most of the time, and since channel catfish can survive low temperatures, unlike Tilapia, we’re ok either way. But since we don’t want water temperatures to be low, we’re stoked to have a significant bump up in water temperatures, thanks to our trusty solar hot water heater. The tomato plants look great and are so far, no worse for wear from multiple nights of below freezing temps. We may be singing a different tune later this winter but for now, we will be happy that our hot water comes from the sun! 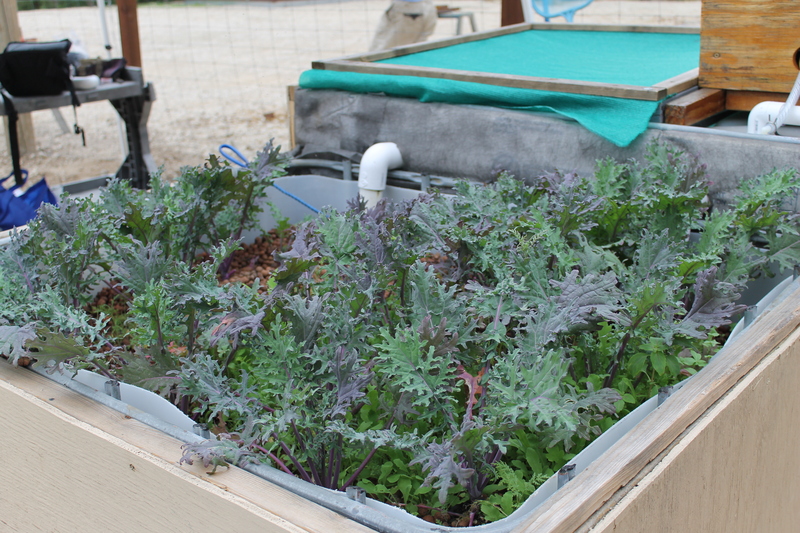 There are many ways to ‘do’ aquaponics. In fact, the concept itself is so broad as to cover everything from rice farmers who have fish in their paddies to high tech climate controlled greenhouse aquaponics. The core concept of polyculture and pairing complementary species like fish and plants gives us something with lots of possibilities. While it would be great to claim that the Santa Barbara Aquaponics model is the best, the best system for you needs to consider your wants, your location, and your level of involvement. 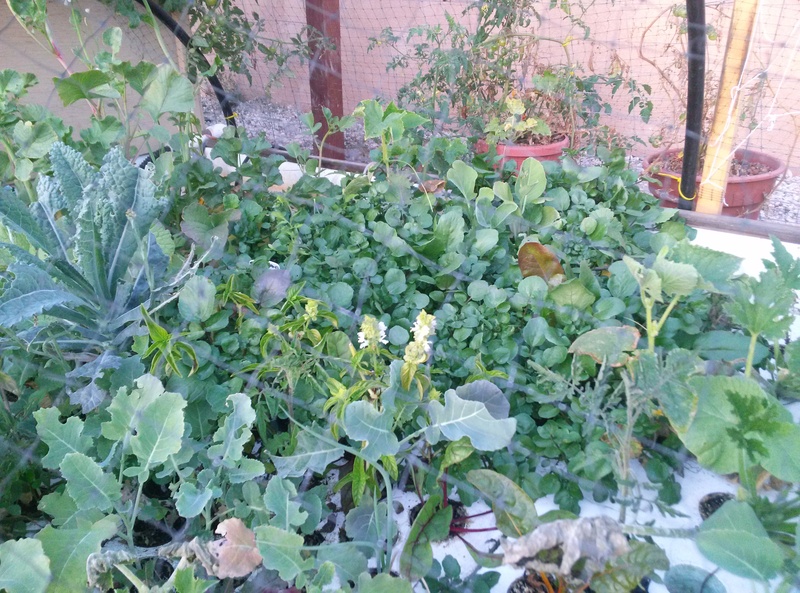 Luckily, aquaponics is flexible enough to meet most people’s wants, location, and involvement. Do you want a system big enough to feed friends and family or have a particular vegetable in mind? Easy enough. Would you rather have a small system to grow herbs that fits on your patio? No problem. Do you need a system that is automated for those long weekends away with the family? That’s possible too. So understand, before you commit to an aquaponics system, think about what you want to grow, what space and sun conditions are available, and what level of involvement you want. Your answers are crucial to helping you or others plan and build your system the way that works for you. System Size- The bigger the better? For some, that is yes. In fact, the economy of scale means making it twice as big sometimes only costs a little more. Balancing the system size with your needs is important. Knowing what types of plants you want to grow helps you plan for how much space you’ll need. System Location- The concept of Right Plant, Right Place common to gardening holds true in aquaponics. If your aquaponics system will get lots of shade or is especially windy, you need to take this into account as well, just like in soil. If you’re on a moderate slope, there are even some fairly easy steps to nearly avoid grading. System Involvement- How much do you want to tinker with your system? Do you want to feed them three or four times a day and keep it immaculate? Will you only have time on the weekends? These are important considerations and will affect how much automation and maintenance you should plan on. 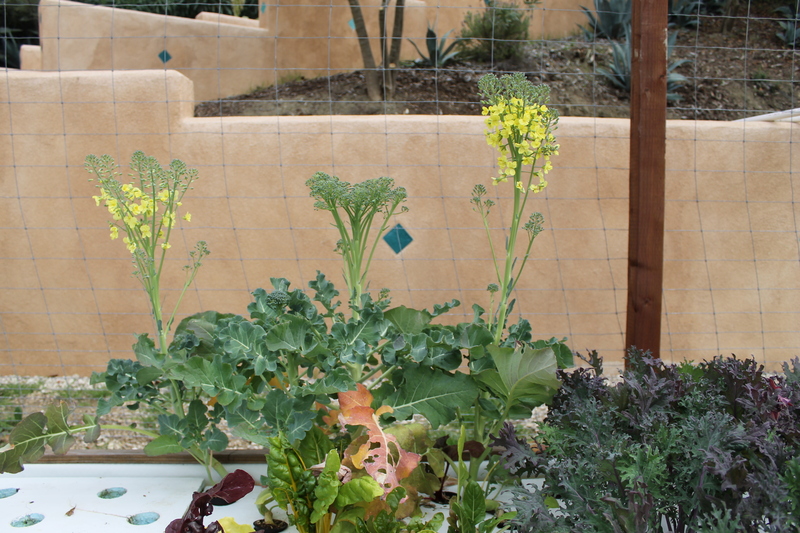 Whatever you choose, know that Santa Barbara Aquaponics is there to help you answer these questions and design a system for you that meets your culinary needs, works within your space, and fits your schedule. What can we do for you? First Public Tour! Sept 21st- SOLD OUT! 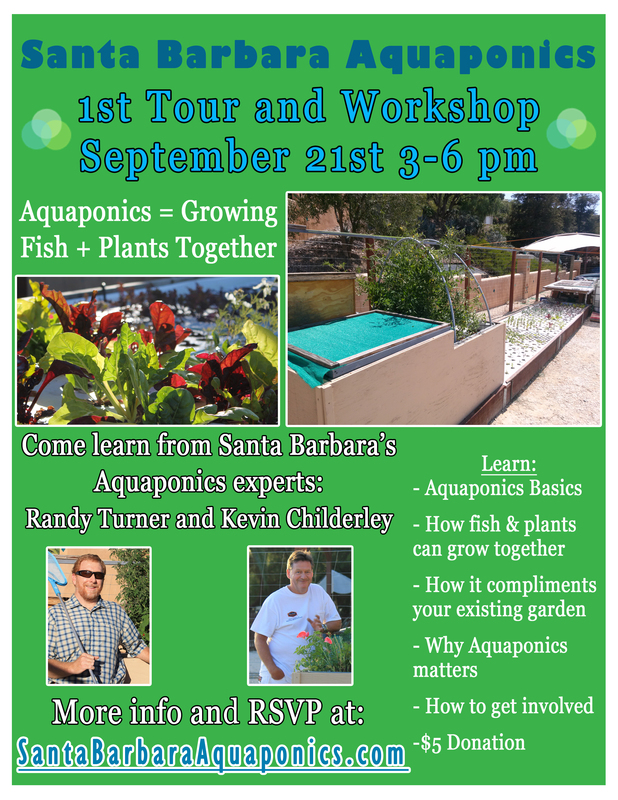 Santa Barbara Aquaponics will be hosting its first ever Public Tour on Saturday September 21st from 3-6 pm. RSVP’s requested. 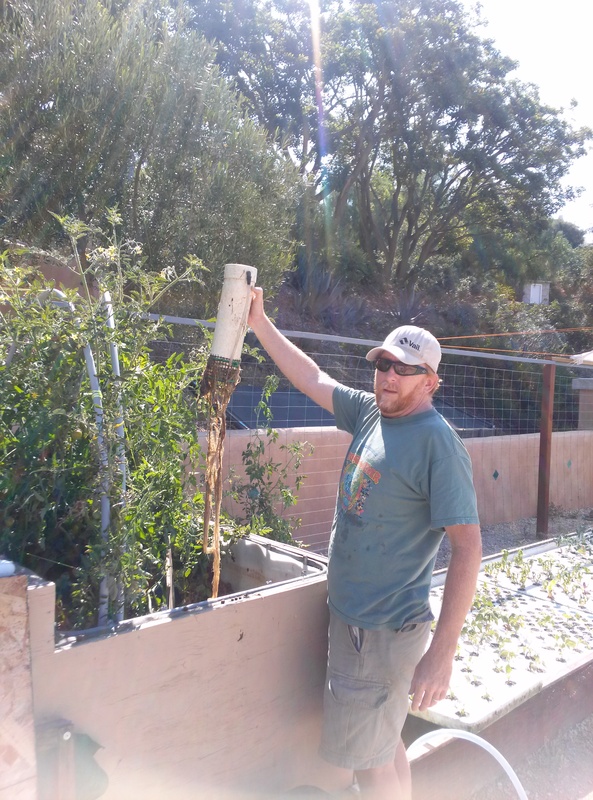 Kevin and Randy will lead a tour of Santa Barbara’s first aquaponics demonstration facility, guide participants through the basics of aquaponics and help participants understand how aquaponics can be a valuable addition to backyard vegetable gardens, koi ponds, permaculture projects, or vacant spaces. Light refreshments provided. Directions for those who have RSVP’d will arrive via email. Thanks for your interest, however we are at capacity for the tour this Saturday. If you are interested in future tours, please leave your name and email below, along with any comments you have. Feds Slash Colorado River Release to Historic Lows. Be sure to play with the slider on the top image to see the difference between a full reservoir and where we are today. If you’ve seen your local reservoir, it might look similar to Lake Mead. So why does aquaponics matter? Because the Colorado River, like nearly all of the rivers in the western U.S., are oversubscribed and there no longer is enough to go around unless you have a series of wet years. Don’t believe me? When was the last time the Mighty Colorado actually reached the ocean? 1998. For regions of the world that are or are likely to be under water stress, having alternative methods of agriculture that use much less water than traditional farming is worth learning about. With as young as aquaponics is in the modern sense, I’m excited about the next 20 years and where the movement will be! We are trying to expand our fish area by putting channel catfish in our deep water culture troughs where we grow vegetables. Since these catfish are only 3-4″, it seems to be working out ok so far since they aren’t trashing the roots of the plants and don’t seem to be eating the mosquito fish….yet. We did notice that when we pick up a raft, we have to be sure we don’t get catfish stuck and pulled out of water! This brings up the question, if we can keep catfish in the trough, do we really need a fish tank?!? The short and admittedly not edge-of-your-seat video is short and was taken when our bell siphon is draining water into the trough, hence, strong flow left to right. Tomato plants are thriving in our 18″ deep media container. They love the nutrient rich water flowing from the fish tank on the left and the fact that the entire container floods and drains every 8 minutes, exposing the roots an alternating bath of nutrient rich water and oxygen rich air. 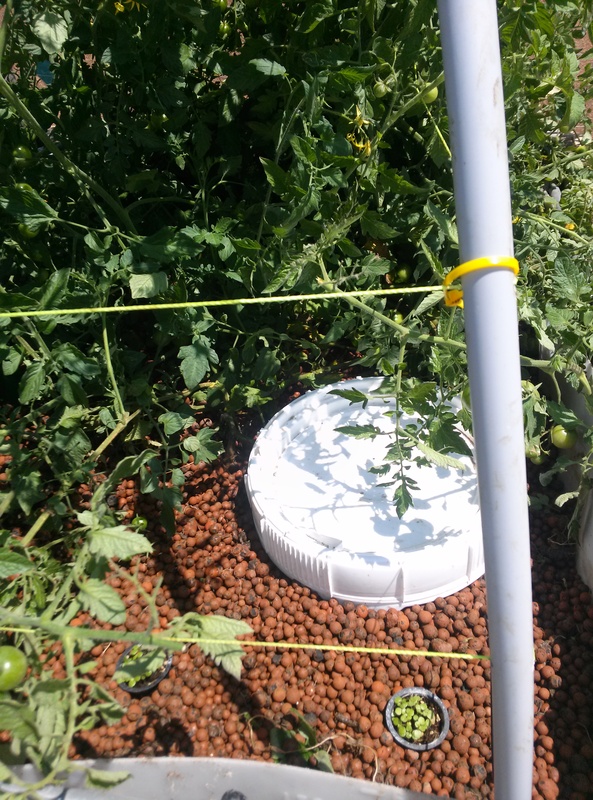 The tomatoes however, have sent roots into the bell siphon, restricting the flow in the siphon outlet, which keeps the siphon from starting reliably. Our water levels were getting higher than normal before the siphon starts, an indication of something wrong. ROOTS!!! Here you see we had to dig out the media surrounding the bell siphon. Randy lifting off the outer shell of the bell siphon. Those 5′ long roots were growing into the high flow of the 2″ outlet. More of the hydroton media removed. 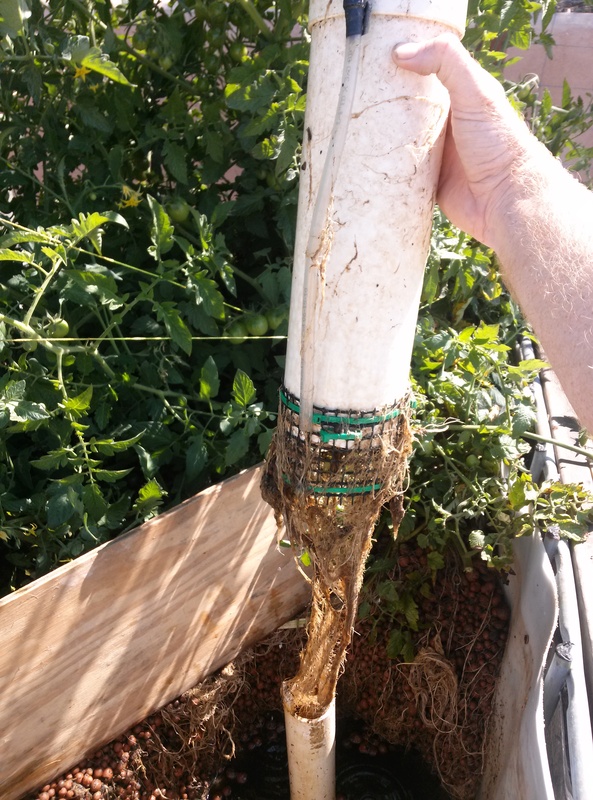 Interesting how the roots of the tomatoes do such a great job holding onto the media that would otherwise be rolling down to the lowest point. The roots held it up like a wall! See the two parts of the bell siphon, the vertical 2″ PVC that drains downward to the lower elevation trough. The larger 4″ pipe on the left normally is placed directly over the 2″ pipe and is the outer shell where water flows into the bell siphon from the bottom and up towards the top opening in the 2″ pipe. Our solution was inserting a 7 gallon bucket as an outer chamber for the bell siphon to keep the roots and media away from the siphon. 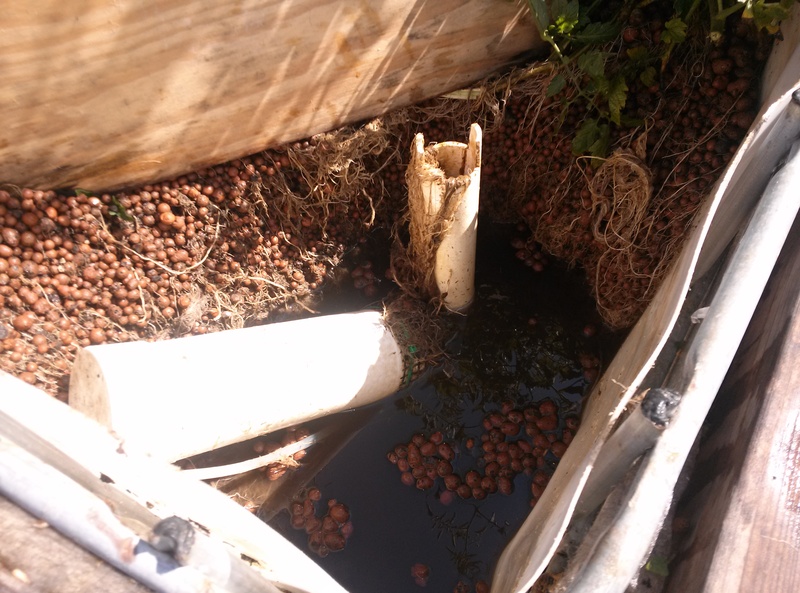 By cutting large holes in the bucket walls and covering it with 1/2″ plastic mesh, the bucket was now a ‘pre-filter’ to keep the media from getting into the bucket. Once the bucket was secure, we refilled the tote with media but not so high that we don’t bury the lid of the bucket. When we unscrew the bucket lid, we now have a ‘window’ into the bell siphon. While we will normally have the lid screwed on, we can unscrew it to cut out any roots to keep the siphon clear, and also to show people how a siphon works. It is now easier to maintain and observe, and we can have tomato or other plants in our media area. We just need to cut the roots occasionally that grow into the new outer chamber. All in all, while it uses more materials, it results in a better, more reliable bell siphon, which counts for something…. Just a few pictures for you tonight. More updates to come again soon.